When we were growing up we never had ribeye steaks they were too expensive. Mom would always split a sirloin steak up for 5 of us. My favorite steak is Italian seasoned grilled ribeye now. The seasoned ribeye is full of flavor and as they say fat is flavor and this is grilled to perfection. We love them seasoned and grilled with mom's seasoning mix. I always love the taste of grilled steak. Mom's Italian style flavors really makes it special! All I can say is Mom loved to cook sirloin steak under the broiler, dad loved his steak on Saturday nights and it was always a night us kids looked forward too, sirloin was all they could afford in those days, they would have loved ribeyes. We would split a huge steak with my two brothers, mom and dad. I hardly ate a thing. Growing up I just loved my fast food hamburger place. Now I miss those days and always make it mom's way. 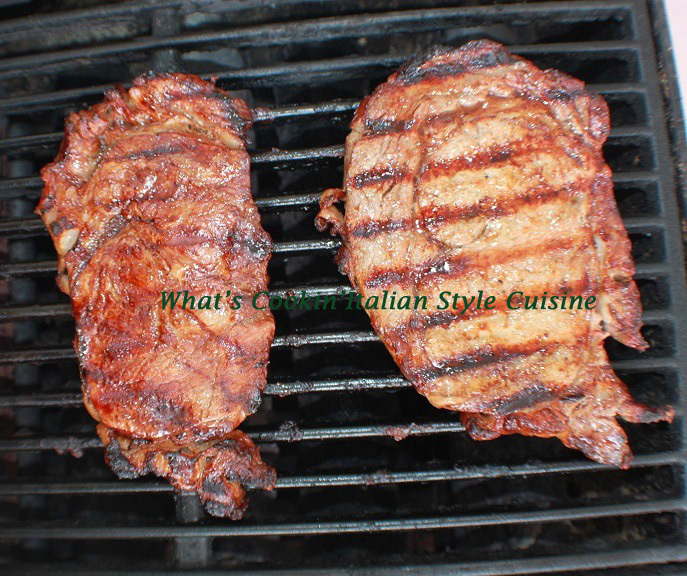 I love ribeye steak since they are tender and flavorful. All winter long even though we would have 6 feet of snow on the ground. We rarely had it on the grill with such unpredictable weather. Most of the time it either rained, snowed or was just plain freezing out. We grew up in Upstate New York, Utica to be exact, we had a charcoal grill back then which to me still has the best flavor for grilling meats. Pretty much gas grills took charcoal grills place and the most popular now. We looked forward to every Saturday night back then as it was family steak night. The seasoning makes they super tasty and no matter which way they are good they are delicious and laced with a garlic flavor inside. Dad always got the biggest piece and ate first, he told the boys when they get their own house and grew up he would get the bigger piece. Back in those days the man worked all day and he ate first. As time went on things changed growing up with those rules. Mom worked a full time job which was unheard back in those days,in the early 1960's but she had her own deli then later on worked in a supermarket as a deli manager. Now this generation is a little different. Some of us are still lucky to have a family night when everyone sits down at the table. I see alot of kids instead bringing their food into the parlor, parked in front of the television that is hooked up to gaming stations to play video games and eating on a paper plate or playing on their cell phones. The man of the house gets whatever is left and the kids eat first. Dad would never had never understood this technical world that has taken over. Geesh the good ole days of yester year.. oh the memories. My oldest brother John would be playing the piano and still does for a living, my other brother Luke would be anxious to sop his bread up in the amazing juices that the steak made with the freshly homemade Italian hunk of bread and probably still does. I can still smell the aroma of that broiled steak. Oh well we have the greatest memories. Luke still has steak Saturday every week! 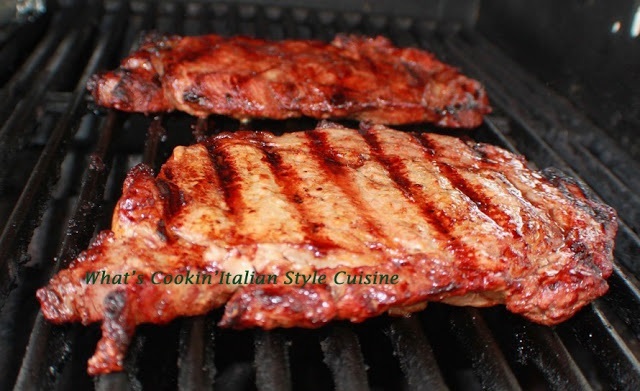 Here is the recipe she used and her version adapted in 2013 using the same ingredients but a grilled version. Cut small slits in the steaks and stuff the garlic cloves inside. Place on a deep cookie sheet of baking dish. Drizzle the steak with olive oil, sprinkle evenly with herbs, spices, lemon juice, salt, pepper, evenly. Marinade overnight or at least three hours. Melt the butter in a small pan, shut off, cool a little then add the burgundy wine mix together, add the pinch of cayenne pepper. Heat the grill on high and cook steak on each side 2 minutes a piece. Lower to medium heat and grill to your desired doneness. Baste with butter and burgundy wine as its cooking.